I recently tried out a certified organic, innovative and active skincare range called SCOUT's Nutraceutical Super Food collection. Some of their products include, The Super Fruit Exfoliating Wash-Off which is perfect for removing makeup, The Balance & Replenish Light Moisturiser, Vitamin C Brightening Serum and the Six Oils of Rejuvenation. Each of the products have been formulated and manufactured in Australia, where they contain many active ingredients (such as Vitamin B3, Peptides, Hyaluronic Acid and natural AHA's) that help leave your skin looking refreshed, hydrated and healthier looking once again. Cleanse - I have been washing my skin using the Super Fruit Exfoliating Wash-Off Cleanser by Scout Cosmetics, RRP $34.95, which contains Blueberries, Grape Skin & Acai. I felt that it was very gentle for a cleanser and it even smelt refreshing and fruity. It works as a powerful cleanser to smooth the skin as well as reduce wrinkles by stimulating collagen production. With continued use of this cleanser, I can definitely anticipate my skin to look fresher and more youthful. Moisturise - Next I'd apply the Balance & Replenish Light Moisturiser, RRP $39.95 which contains Calendula, Red Mandarin & Pumpkin. It's so light for a moisturiser which is why it's perfect as a makeup base too. Otherwise, you can just use this as part of your regular skincare routine. I felt that this moisturiser looked to soothe out any redness or irritations on my skin which is great if you tend to get a little redness from time to time. As a moisturiser, it's more suited to those with oily, combination to normal skin as either a day or night time moisturiser. Balance - You can choose to use the serum either before or after you apply your moisturiser. It all depends on what suits your skin better of course. I checked out the Vitamin C Brightening Serum, RRP $45.95, which really looks to deliver more of a radiant and youthful glow to your overall appearance. Both the Kakadu Plum extract and Vitamin C, combine to protect your skin from radical damage as well as brighten up your skin. My skin definitely felt more plump and hydrated after using this serum which is amazing because I've been looking for a product that's full of active ingredients that work. Rejuvenate - Look to massage about 3-5 drops all over the face and decolletage with using the Six Oils of Rejuvenation (Avocado, Sunflower and Carrot), RRP $39.95. This packed vegan blend of oil looks to nourish the skin leaving it feeling moisturised and hydrated. The anti-aging Six Oils of Rejuvenation is formulated to concentrate and draw on the benefits of each individual oil to rejuvenate and improve the skin’s natural defences for a smoother and healthier complexion. Overall, I really enjoyed using these products as part of my everyday routine. With using these products to follow through for everyday, it has definitely suited my lifestyle. For a Superfood skincare range, I'm quite impressed with the active ingredients and formula of it all. My skin looks so much clearer and I would recommend the range if you're looking to try out effective and gentle products for the skin. All of the products as mentioned above is available via Scout Cosmetics' official website here and social media channel here. 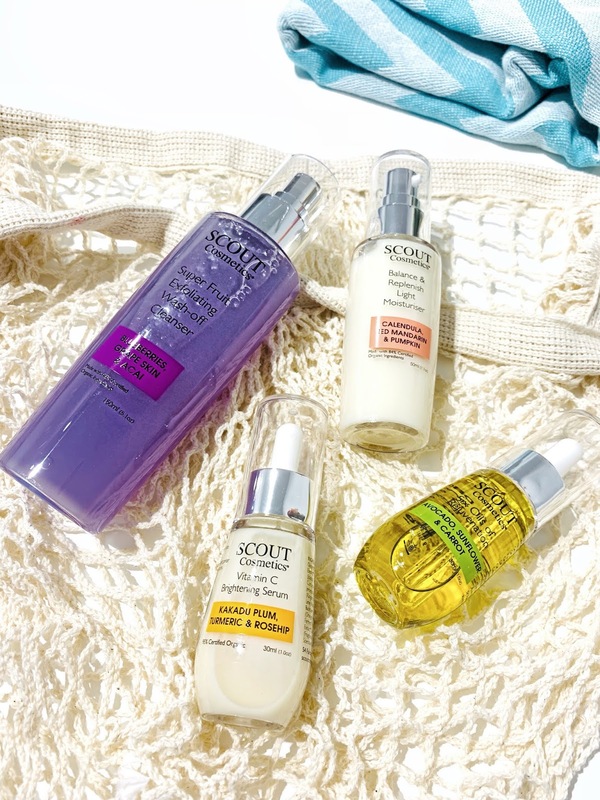 Have you tried any skincare products from Scout Cosmetics?